for webmasters and web developers on how to help make their sites look great in Google Chrome. If you work on web sites, you'll want to take a look at the post and give your site a run through with Google Chrome. If you're interested in more information, check out our support resources for webmasters or the Google Chrome webmaster forum. We're constantly working to improve website compatibility, but we'd love your help! If you run across compatibility bugs while testing your site in Google Chrome, please let us know. We recently posted some handy tips for webmasters and web developers on how to help make their sites look great in Google Chrome. , Mr. Doob, Ryan Alexander, Josh Nimoy, and Toxi, among others, answered the call. in December, we've been updating two release channels: developer and stable. With our latest release, we're re-introducing the beta channel for some early feedback — and if you're reading the brand new Google Chrome blog, you are probably just the person to give it a try. 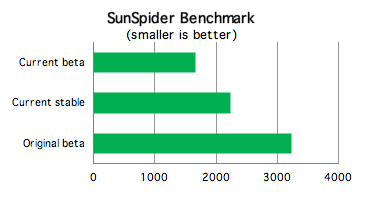 The best thing about this new beta is speed — it's 25% faster on our V8 benchmark and 35% faster on the Sunspider benchmark than the current stable channel version and almost twice as fast when compared to our original beta version. Getting on the beta channel means your version of Google Chrome will regularly get updated with new speed enhancements, features, and bug fixes before most users see them. We're doing our best to quickly churn out new features as they are available rather than saving them up for occasional major releases. Riding the beta channel is a great way to let us know about what's working and what's not, but don't be surprised to find some rough edges. Also, if you're looking for an even earlier (and rougher) sneak preview of things to come, you can always move to the developer channel. Try out the latest Google Chrome BETA. Since we took the "beta" tag off Google Chrome in December, we've been updating two release channels: developer and stable. With our latest release, we're re-introducing the beta channel for some early feedback — and if you're reading the brand new Google Chrome blog, you are probably just the person to give it a try. we launched our web browser, Google Chrome. Since then, we've pushed 29 updates, each working to improve Google Chrome's speed, stability, and usability. Today we're launching the Google Chrome Blog. Here we will post feature releases, announcements, and updates on other things we're working on. 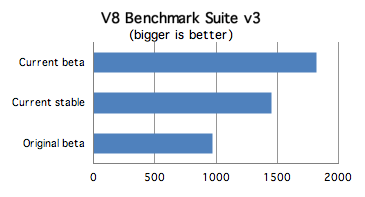 Chromium Blog readers, have no fear! The Chromium Blog will continue to live on, but will shift its focus to things that are particularly relevant to the developer community. This blog is intended for you, so if at any point you have any comments or suggestions, please let us know so that we can make improvements. Just over 6 months ago we launched our web browser, Google Chrome. Since then, we've pushed 29 updates, each working to improve Google Chrome's speed, stability, and usability.